Consider this menu: Fartless Herring, CanBeSmart Curry, Rollercoaster Martini. These are among the 21 recipes in “The Ig Nobel Cookbook,” Volume 1, a 40-page guffaw released on Sept. 6. Nobel laureates, as well as past winners of the Ig Nobel prize and organizers of the Ig Nobel prize ceremony, are contributors. The book’s release coincides with the 24th annual Ig Nobel awards on Sept. 18; the theme this year is food. “The Ig Noble Cookbook” is as irreverent as its namesake. Awards are given to those who authored unusual scientific studies with chuckle-inducing premises, yet serious thought. Catherine Douglas, a teaching fellow at Newcastle University in the UK, won in 2009 for showing cows that have names give more milk than cows that are nameless. In the cookbook, her “idiot proof” cake recipe recommends dairy products from named cows with access to pastures. 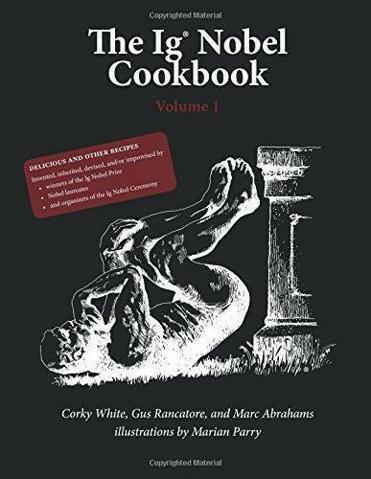 The cookbook was coauthored by White, Gus Rancatore, owner of Toscanini’s Ice Cream in Cambridge, and Marc Abrahams, editor of the Annals of Improbable Research and founder of Ig Nobel. The quirky line-drawings were contributed by noted illustrator Marian Parry of Cambridge. Although the winners this year are not necessarily receiving their awards for food-related topics, Abrahams says, “Food is a universal theme among human beings and there’s a lot going on right now in the field.” Ten winners, to be announced at the event, were selected from 9,000 nominations. The event is sold out, but can be watched on live-stream. “The Ig Nobel Cookbook” Volume I costs about $13.50 at online bookstores. The Ig Nobel Awards Ceremony on Sept. 18 will be broadcast live at www.improbable.com. Due to a reporting error, an earlier version incorrectly referred to the Annals of Improbable Research.